Cholesterol test is a blood test performed to check levels of cholesterol, a substance that helps transport fat through the blood. The web server used by Cholesteroltest.net is located near the city of Orlando, USA and is run by Apyl. 78 other websites are located on this web server. Most of them are provided in the english language. 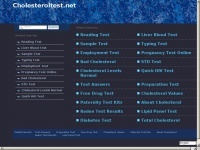 The webpages of Cholesteroltest.net were developed using the programming language ASP.NET. The markup language of the website is XHTML 1.1. The visitor analysis software Google Analytics is used to analyze the visitors of the websites. The website does not specify details about the inclusion of its content in search engines. For this reason the content will be included by search engines. In order to display ads the Google Adsense advertising network is used.